Rocky Point Park was an amusement park on the Narragansett Bay side of Warwick, Rhode Island, United States. It operated from the late 1840s until it closed in 1995. The following year, the park filed for bankruptcy. Rocky Point Park was first conceived by Captain William Winslow in the 1840s. By 1847, he had purchased a part of the land and began to offer amusements and serve dinner. 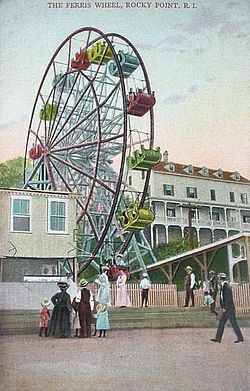 From the 1950s through the mid-1990s, Rocky Point Park was one of the most popular attractions in Rhode Island. It featured rides such as the Skyliner, Corkscrew Loop Roller Coaster, Log Flume, and the Freefall (similar to the identically named ride at Six Flags parks), which fell 13 stories at 55 mph (89 km/h). It also featured the Shore Dinner Hall, famous for its clamcakes, steamers, lobsters, and New England Clam Chowder, which seated over 4,000 patrons at a time. In later years, Rocky Point's locally-famous logo of a lobster tipping his hat was used in much of the park's advertising both in TV commercials and in print. The park's circa 1963 Castle of Terror dark ride (renamed House of Horrors in 1970) was one of its most popular rides and lives on in social media conversation decades after its demolition. In addition to its amusement rides, Rocky Point also occasionally hosted concerts in its Palladium ballroom. Musical artists who performed at the venue during its final 30 years of operation include: The Yardbirds (1967), Big Brother and the Holding Company with Janis Joplin (1968), Sly & The Family Stone (1969), REO Speedwagon, AC/DC and Thin Lizzy (1978), Blue Öyster Cult (1984), Samantha Fox (1989), Jane's Addiction (1991), Ramones (1991), Red Hot Chili Peppers and Pearl Jam (1991), Pixies (1991), "Weird Al" Yankovic (1992), Sonic Youth (1992), Dream Theater (1993), Peter Frampton (1994), Lush and Weezer (1994), and the venue's final concert, Roomful of Blues (1994). The park was the inspiration for the title of Rocky Point Holiday, a 1966 composition for wind band by Ron Nelson. In the early 1990s, Rocky Point's financial situation became shaky. The privately held company that owned the park began to lose money as it attempted to keep the park up to date. Critics accused the company's shareholders of trying to wring every last penny out of the park. Rocky Point closed in 1995, then reopened briefly in 1996 as a farewell to patrons. Rides such as the Flume and Corkscrew were sold in an auction and are now in use at other amusement parks. For a number of years Rocky Point was making large loans to unrelated companies that were also owned by the RP shareholders. Those companies were put into Chapter 11 and Rocky Point could not collect repayment. Finally in 1991 Rocky Point was severely over-leveraged, again, to loan $6 million to other unrelated companies owned by the RP shareholders. Those companies were then put into Chapter 11 so Rocky Point could not collect on those loans either. Staggering under this heavy debt load, which was not its own debts, Rocky Point simply could not pay its own bills to survive. These facts were published by The Providence Journal and the Warwick Beacon during the bankruptcy periods of 1995-1997. After the Rocky Point land was purchased for $8.5 million in 2003, the park's main building, known as the "Big House", was hit by vandals who lit it on fire on September 2, 2004. Police said the fire was suspicious, because the building had no electricity at the time. Another fire started on October 16, 2006 around 11 a.m., this time in an executive building on the waterfront. Smoke could be seen billowing up more than 2,000 feet (610 m) in the air from miles away. Police reported no injuries in either fire. It is unclear if this fire was caused by arson. On May 7, 2007, demolition of the remaining midway officially began with a press conference at the park. Prior to this, a handful of stands and minor buildings had already been demolished. On September 7, 2007, a documentary film about the park, You Must Be This Tall: The Story of Rocky Point Park, had its world premiere at the Stadium Theatre in Woonsocket, Rhode Island. The film garnered a five-star review from The Providence Journal and played to a sold out crowd of 1,100 people. In February 2008, the city of Warwick secured a federal grant to purchase about half of the 82 acres (33 ha) remaining Rocky Point Park, including much of the view of the bay. The city officially took title to 41 acres (170,000 m2) shoreline of the former park in August 2008. On November 2, 2010, a ballot proposal passed to issue state funding to "acquire the title to land in and around what used to be Rocky Point Park to establish the land as a public park." On September 17, 2012, the Small Business Administration accepted the state's offer to purchase the Rocky Point property to be developed into a State Park. On March 28, 2013, the sale of the remaining 82 acres of the former amusement park was conveyed to the state of Rhode Island. The RI Department of Environmental Management (DEM) will oversee the operation and maintenance of the entire property. On August 20, 2016, the film “Tales of Rocky Point Park” premiered at the Park Cinema in Cranston, RI. The film chronicled real events and urban legend over the amusement park’s long run. On June 26, 2011, Rocky Point was once again opened to the public and features a new asphalt mile long walking path along the shore of Narragansett Bay. The Shore Dinner Hall was later demolished while the rest of the amusement area was cleared and opened to the public. The majority of the amusement park space is now an empty field for the passive use park. A few elements of the park remain, including the upper and lower stations for the Skyliner gondola ride, ruins of an old water tank, and a large arch by the entrance that was originally built for the 1964 World's Fair in Flushing, Queens, and subsequently moved to Rocky Point. As of November 2014[update], the State of Rhode Island is coordinating the development of Rocky Point State Park with the City of Warwick. Use by the public is being managed by the DEM Parks and Recreation office. ^ "World's Largest Shore Dinner Hall, Rocky Point". CardCow.com. Archived from the original on 2013-01-03. Retrieved January 3, 2013. ^ "Rocky Point concerts". RIRocks. Retrieved 4 March 2019. ^ "Website for You Must Be This Tall". rockypointmovie.com. Archived from the original on 2007-03-17. Retrieved January 3, 2013. ^ "In re: C.R. AMUSEMENTS, LLC d/b/a ROCKY POINT AMUSEMENT PARK" (PDF). Archived from the original (pdf) on 2006-02-12. Retrieved January 3, 2013. ^ Cynthia Needham (May 8, 2007). "It's the end of the line for beloved Rocky Point". The Providence Journal. Archived from the original on 2007-06-04. Retrieved January 3, 2013. ^ Michael Janusonis (September 7, 2007). "Movie review: Rocky Point rides again in You Must Be This Tall: The Story of Rocky Point Park". The Providence Journal. Archived from the original on 2007-09-17. Retrieved January 3, 2013. ^ "Round and Round They Go: Remembering Rocky Point Park". rockypointpark.org. March 24, 2008. Archived from the original on 2008-07-07. Retrieved January 3, 2013. ^ Barbara Polichetti (August 14, 2008). "No challenges to Warwick's acquisitions of 41 acres of former Rocky Point Amusement Park". The Providence Journal. Archived from the original on 2011-06-22. Retrieved January 3, 2013. ^ "Rhode Island Capital Bonds for Open Space Question, Question 4 (2010)". Archived from the original on 2013-01-03. Retrieved January 3, 2013. ^ Mario Hilario (September 17, 2012). "RI purchases Rocky Point to develop state park". Turnto10.com. Archived from the original on 2013-01-03. Retrieved January 3, 2013. ^ "The Rocky Point Foundation". Retrieved 7 April 2013. ^ Paul Davis (June 21, 2011). "Update: Part of Rocky Point Park opens Friday". The Providence Journal. Archived from the original on 2011-06-23. Retrieved January 3, 2013. ^ Parker, Paul Edward (1 January 2015). "First Day Hike highlights newest state park at Rocky Point / Gallery". Providence Journal. Retrieved 12 November 2016. ^ Forsberg, Tim (21 January 2016). "Mystery of the Rocky Point 'Tower'". Warwick Beacon. ^ Grosch, Connie (27 September 2016). "Iconic Rocky Point arch unveiled – with fresh paint". Rhode Island Foundation. ^ "Rocky Point State Park". Rhode Island State Parks & Recreation. State of Rhode Island Division of Parks & Recreation. Retrieved 28 May 2015. Wikimedia Commons has media related to Rocky Point Park (Rhode Island). This page was last edited on 1 April 2019, at 01:30 (UTC).